Out of the millions of American health and fitness enthusiasts more and more are choosing to work out from the convenience of their home and office. Fitness companies are supporting this by producing better and smarter treadmills that can provide a variety of running, walking and jogging options those wanting to opt for the indoor workout. Finding the best treadmill under $1000 can be a cost-effective path to fitness. Many of these new devices are not cheap, however, with top of the line treadmills costing $4000 or more. But, if all the bells and whistles are not your top priority, cheaper options are available with no loss of performance or quality. Further in this article we will review various top end machines that won’t cost more than $1000. First, let’s look at some important considerations for selecting a budget treadmill. The first consideration will be your personal fitness goals. If you are looking to improve your general health and fitness or looking to push your athletic capability to the limit, knowing the type of use you will be getting from your treadmill is the best way to get the most from your experience. Ergonomics and Comfort – Will you be running or walking? Runners will need enough length to accommodate a longer stride. Consider your level of comfort on any particular machine when you will be running or walking. 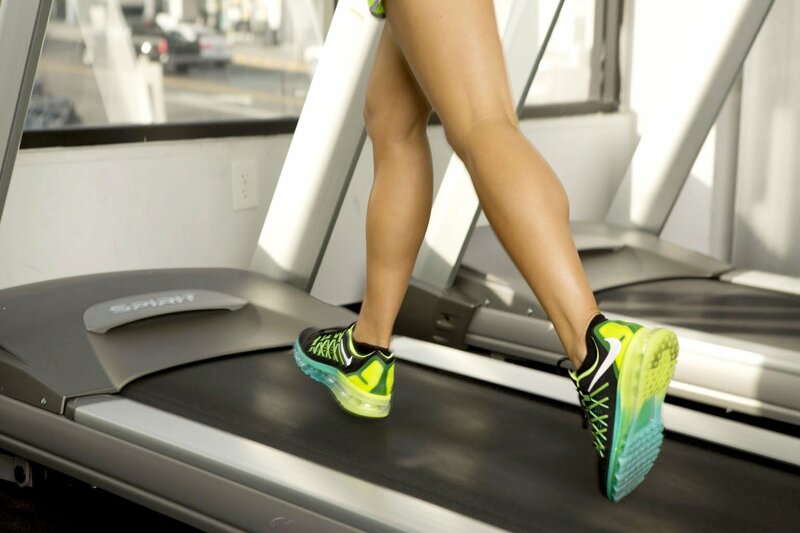 The treadmill you pick should appeal to you both ergonomically and functionally. Other Features – There are supports for USB devices that record progress, others allow for music with iPod ports. 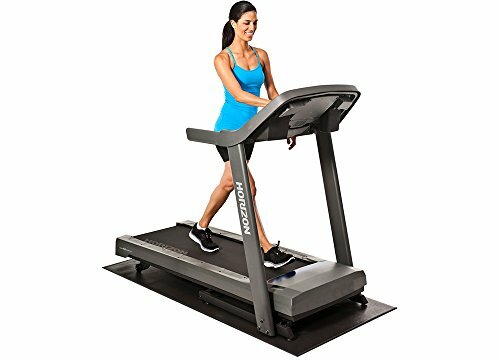 Bluetooth and wireless internet connections are also available in some varieties of treadmill. Adjustability – The average top speed supported by a treadmill is anywhere between 10 to 12 MPH but some machines can work faster. You can also expect an average incline of 10 to 15 percent and some have a greater incline. Assembly and Weight – Ergonomics and comfort should be the primary factors in making a treadmill selection. But knowing how you will fully install your treadmill in advance can avoid some frustration once it arrives at your home. The Weslo Cadence G 5.9 provides 6 different workout routines designed by professional fitness trainers. This is especially beneficial for maximizing time spent working out. Comfort cell cushioning is important for keeping knees safe and work out sessions as comfortable as possible. There is also a 2-position manual incline that can allow for more intense workout programs aimed at increasing personal performance. Space saving design allows the treadmill to fold up for easy storage. Six workouts designed by professional trainers. 2 Incline Positions adjusted manually. Blue LCD screen for tracking speed, distance, heart rate and calories burned. The 6 personal training workouts are especially beneficial, but affordability and functionality are the greatest selling points of the Weslo Cadence G 5.6, according to the majority of buyers. The option to store this treadmill in a small place makes it a great space saver too. It is even reportedly quieter than an average dishwasher. Some buyers had a bad experience with products arriving in poor conditions or with pieces missing. At least one customer was able to get a replacement for her faulty treadmill, but this is something to be aware of. 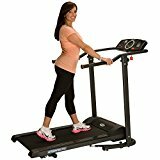 For a workout option that will keep you in shape through the inclement weather and from the comfort of home, this high quality machine is worth twice the low cost. It is great for small spaces, comes with minimal setup and, according to users, lasts for years. The NordicTrack T 6.5 S Treadmill comes with 20 individual workout apps created by professional trainers, a fully integrated sound system for your iPod or MP3 and a handy heart monitor in handle grips to keep tabs on your personal progress. The NordicTrack T 6.5 S Treadmill also has two different deck rigidity settings. For a softer run that is easy on the joints try the FlexSelect Cushioning deck. The second option lets you run on a firmer surface for more realism; these two options can be switched at the turn of the knob. You can also digitally increase the incline a full 10% to increase calorie burn. Select from 20 different training levels for improved fitness goals. The fully integrated sound system and the 20 different training levels received a great response from buyers. The handy cup, bottle and towel holders located on either side of the display enhance the exercise experience more than most people would imagine. Although assembly is required and the box is especially heavy, many of the online reviewers reported this to be an easy task with plenty of guidance. Assembly can be completed by anyone in under an hour. This item also comes with a 25 year warranty on the motor and 1 year warranty for parts and labor. One hair-raising review stated that this treadmill has a tendency to pick up speed of its own volition; that could add a surprisingly dangerous twist to your routine. Another reviewer mentioned scratches and dents on the treadmill’s large display. Nevertheless, the vast majority of reviewers had only good things to say. The NordicTrack T 6.5 S Treadmill offers many nice options you would normally expect out of pricier treadmills, like digital incline control and the iFit system compatibility. Having an audio system for motivational music or your favorite shows is always a nice touch in indoor exercise equipment. The ProForm 505 CST Treadmill ensures a challenging yet enjoyable workout every time with convenient QuickSpeed buttons allowing the user to adjust the speed to what is most appropriate for their fitness level. Comfort is also improved due to innovative ProShox cushioning system that effectively protects the knees, hips and joints from damage due to continuous shock from hard decks and pavement. You will also be able to keep your motivation levels high by hooking up your music devices to a fully compatible music port. Space Saver Design folds up for plenty of room when not in use. The best selling point for the ProForm 505 CST Treadmill according to many buyer’s comments has been comfort. The ProShox Cushioning system offers great protection for those who must be mindful of their knees and ankles. This also makes it a great entry-level treadmill for people shedding pounds for health reasons. The quality sound system and quiet motor make another likable combination. The handy aux port will allow you to hook up your tablet to the integrated speaker system, allowing you to catch all the latest exploits from Game of Thrones while you burn those calories. The assembly required to get your ProForm 505 CST Treadmill up and operating has been a difficult task for some who own this machines. Still, others say it gave them no difficulty at all. If you feel like your skill with a screwdriver and capacity to decipher instruction manuals could use some improvement, you may need to call cousin Bob for this one. For a comfortable and enjoyable experience on your treadmill this is an excellent option. The comfort deck may not be as “realistic” as a professional runner would need to increase performance. But they will have a great time trying. The LifeSpan TR1200i Folding Treadmill won the “Head of the Class” Treadmill for under $1,000 in 2011 and the Treadmill Doctor “Best Buy” award. The TR1200i’s 2.5 hp continuous-duty motor is designed for unflinching performance through the years. The EZfold system makes the stowing and setup process comparatively simple as the mechanical system does most of the heavy lifting. The system also features the Intelli-Step system where all your calories, distance, step count and heart rate records can be recorded for daily progress checks. Comprehensive LCD console provides data on calorie, speed, distance and time. If this is a treadmill that ticked every box, the ultra-powerful and barely audible motor is probably the biggest “tick” of all. This powerful motor and the steel frame were built with durability in mind and consumer reports all seem to agree. The Intelli-Step system is a terrific way to make measurable progress. Many people opt for the “5,000 steps a day” for better health and this is a good way to make this happen. A quick and easy assembly is also a common comment amongst buyers. iPod hookups are always a popular feature for staying motivated and keeping pace they are also featured in the TR1200i. The unimaginable weight of this product on arrival is a good enough reason to make sure you have a plan for getting it into your home gym. Another point that has been mentioned is the lack of high quality speakers, it’s not that the sound system is bad just not nearly up to par with the rest of the machine. For the serious trainer and beginning health enthusiast, this is a great option. Strong and sophisticated components mean the TR1200i will be ready for service for years to come and that’s really what a serious health and fitness enthusiast is looking for. Click here for one customer’s review of the “pros and cons” of this device. The Exerpeutic TF1000 Electric Treadmill is designed especially for those who will be walking to better health. 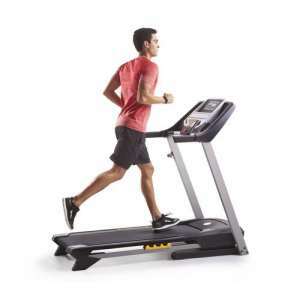 With a top speed of 4 MPH, this ”walking” treadmill promotes a lower intensity workout. Walking has many of the same benefits found in running when performed consistently and for the correct amount of time. It is also comparatively easier to commit to low intensity workouts especially for beginners. An extra-wide tread can be set to two incline levels for increased heart rates and calorie burn. Heart Pulse pads and an extra wide LCD screen provide information of distance walked, calorie burn, lapsed time, speed and pulse. Longer handle bars for increased safety. Simplicity would be one of the biggest selling points for the walking treadmill by Exerpeutic. Quiet motors are always a nice addition (especially if there are no speakers). Even though this treadmill has a weight capacity higher than any other treadmill on this list, customers found it surprisingly light weight – just about anyone could move this around alone. One reason for many buyers’ enthusiasm was that this option makes an excellent walking treadmill desk. Why not put this time to excellent use and get ahead with those yearly reports while addressing your fitness goals. Here is a link to the way one reviewer made their “treadmill desk”. The bells and whistle were left out of this product, no speakers, no auto incline, no sophisticated jogging screen and absolutely no running. This walking treadmill is simplicity in its finest, with none of those frivolities to interfere with your fitness goals. Low intensity workouts are easier to commit to and this is a good reason to consider a simplistic walking treadmill. People who are exceptionally overweight for example, will do their knees and joints a favor by beginning a low intensity regime and not pushing themselves too hard. For more information on the different intensity workouts click here. From the producers of Schwinn cycling technology comes a comprehensive solution to indoor exercise. The Schwinn 830 Treadmill has all the extras that make indoor workouts so much fun. You will also find the best apps and technology support for your fitness goals. 0 to 12 MPH — the highest speed on this list so far. Media shelf for books, magazines, tablets or other devices. Fun for the whole family and professional grade performance meet in feature packed treadmill. Those looking to max out their top speed will be able to digitally increase speeds and incline while in motion. Love running indoors but miss the wind in your face? This treadmill features a built in fan for cooling off and a realistic experience. This treadmill also features an impressive sound system over a super quiet motor and assistance in folding up after a workout. Some buyers report that the plastic parts (cup holders, bolt covers and display casing) seem very flimsy in comparison to the rest of the device. Original setup is another common comment. The box arrives weighting a full 220 lbs, according to one buyer, and requires plenty of setup before operational. The Schwinn 830 Treadmill is for everyone and anyone. The ultra-comfortable deck is perfect for saving sensitive joints while the high top speeds are great for pushing all kinds of limits. Digital incline, speed and folding control make the user experience all the better. The Horizon Fitness T101-04 Treadmill is perfectly suited to lower intensity workouts but can reach a top speed of 10 MPH. Knees, ankles and joints throughout the body a protected by an adjustable cushioning system and provides plenty of techy features that add to the overall exercise experience. Great customer service has been put to the test here and it seems to be up to the task. The Horizon Fitness Treadmill has received praise for being a good basic treadmill for low intensity workouts. The best buyer comments come from the type of people who don’t put too much strain on their apparatus for example senior citizens. The easy setup and numerous extra features (like a sound system and cooling fan) have also been mentioned in a few customer comments. One satisfied customer posted a insightful video review of this product and its most significant features, you can find it at this link. A few buyers mentioned that the T-101 motor is anything but “whisper quiet” or reported other problems including defective roller bearings, excessive noise after the first few months or ten miles, useless cooling fan and poor sound quality from the speakers. Even the best reviews of this product came with some negative comment regarding poor quality manufacturing. This may not be the best product for someone looking for heavy duty training or serious life changing fitness goals, it might not survive long enough to pay for itself. Those looking for a suitable walking or (lightweight?) jogging treadmill will get the most out of a decent product like this. The best treadmill for under a thousand dollars is the one that best matches your fitness, ergonomic, and economic needs. With this in mind here are our top three picks for best treadmill that won’t cost more than $1000. Schwinn 830 Treadmill – An all-round treadmill that delivers all the bells and whistles and high-performance, the Schwinn has it all. The perfect choice for a beginner looking for dynamic exercise and the all-star marathon champ looking to escape the weather. Proform 505 CST Treadmill – Comfort can’t be underrated. If you love the chase but don’t want sore knees and aching ankles, next level PROSHOX cushioning is the thing for you. 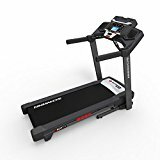 Weslo Cadence G 5.9 Treadmill – All you’d expect in a top-of-the-line treadmill at a giveaway price. This cost -effective option has programed training, built in speakers and manually adjusted incline positions – at this remarkably low price, it’s arguably the best treadmill under $1000.